Next month (Saturday 16th February) Wincanton Racecourse stages its top race, the historic Grade 2 Bathwick Tyres Kingwell Hurdle, a key trial for the Stan James Champion Hurdle at Cheltenham. The £60,000 prize fund is guaranteed to attract the best two-mile hurdlers in the business, doing battle to join a roll of honours that includes Kribensis, Alderbrook, Hors La Loi III, Katchit and Punjabi who have used the race as a stepping stone to Cheltenham glory. Last year's Bathwick Tyres Kingwell Hurdle winner Binocular, meanwhile, had already been crowned champion hurdler having won the Cheltenham Festival showpiece two years earlier. 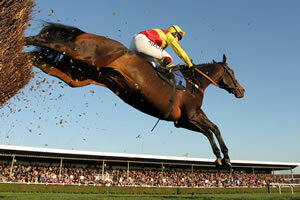 And once again Wincanton's showcase will be eagerly awaited by those looking for Cheltenham Festival pointers. Binocular had landed the Champion Hurdle at the second attempt in 2010 as he stepped up on third place at Cheltenham the previous year. Having won the Grade 1 Christmas Hurdle at Kempton, he then won the Kingwell Hurdle but could only finish fourth in last year's renewal of the Champion Hurdle behind Rock On Ruby, trained by Devon-based Harry Fry. The class of 2013 will be looking to join a Kingwell Hurdle roll of honour and reaps the rewards of a £129,000 total prize fund across a seven-race card. The undercard is headed by the Country Gentlemen's Association Veterans' Handicap Steeple Chase, a two-mile, five-furlong race for horses aged 10 or older, where we are sure to see some of the best known names in national hunt racing in action. "Prize money is part of the life blood of the sport and as a Jockey Club Racecourse all Wincanton's profits are reinvested back into the sport. 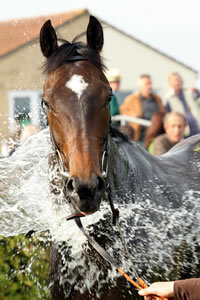 We look forward to celebrating Somerset's showcase race in early February." Gates open on Saturday, February 16th at 11:30pm with the first race at 1:20pm. Tickets are available from £14 when booked in advance on 08445 793014 or www.wincantonracecourse.co.uk, with complimentary entry to children under 17 years when accompanied by an adult. The Courtesy Bus will meet the trains coming into Templecombe at 11.25am (London Waterloo) and 11.43am (Exeter St Davids) and will leave the racecourse at 5.00pm. Join the stars from the racing world at Wincanton Racecourse's Cheltenham Festival Preview Evening on Thursday 28 February, sponsored by Paddy Power. Champion trainer Paul Nicholls and local jockey Joe Tizzard will be on the panel to answer all your questions about their runners at the Festival of jump racing and to give their opinions their rival's runners. Channel 4 Racing's Alice Plunkett will host the evening with colleague Tanya Stevenson on hand to offer advice on market movers, bankers and blow outs. Join us from 7.00pm with the panel starting at 7:30pm on 28 February for an evening of informed entertainment. Tickets cost £20 each and include a hot supper. To book call on 08445 793014.